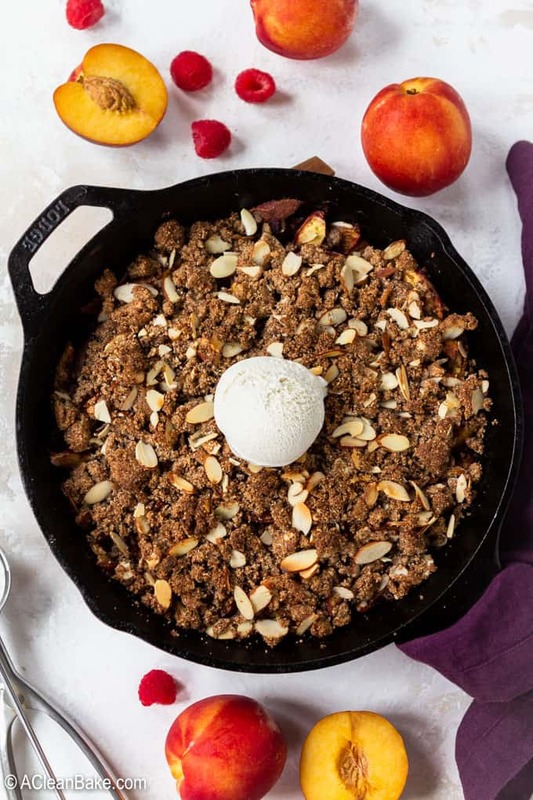 Raspberry nectarine crisp is a perfect grain free way to celebrate peak summer fruit! 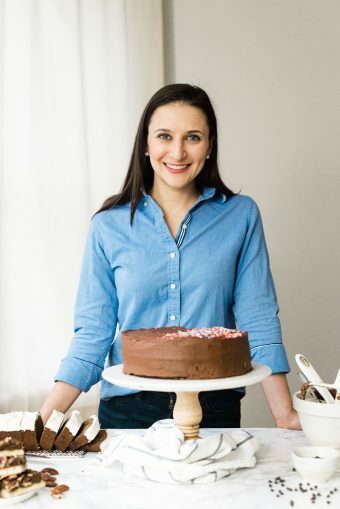 It’s a simple gluten free, paleo, and vegan dessert that is simple enough for a weeknight, and elegantly rustic enough for an outdoor dinner party. Plus, you can make it ahead of time! Top with a scoop of your favorite ice cream and dig into the dessert of the summer. If you’ve ever met a more under-appreciated summer fruit than the nectarine, particularly in dessert, then I feel for that fruit. 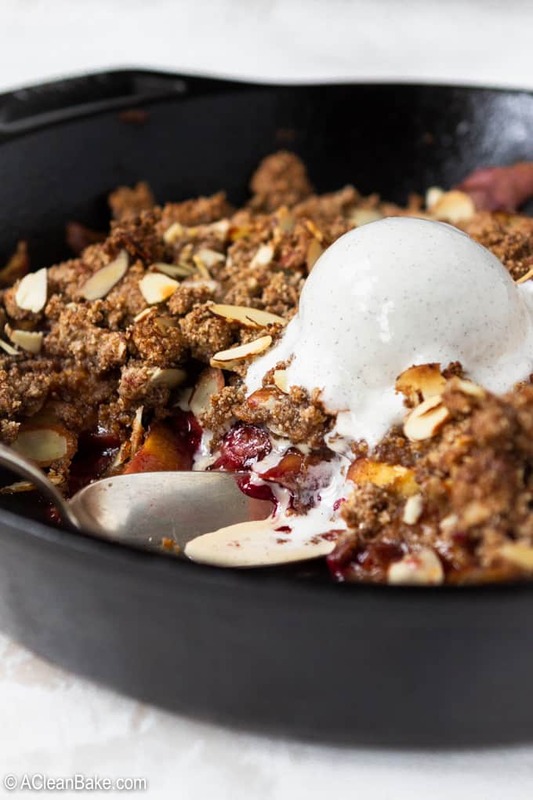 Nectarines – the less-fuzzy, usually more expensive, and generally less enticing neighbor of the peach family – tend not to be picked up when someone is thinking about making a pie or a cake or even luscious grilled fruit, and that is a darn shame. They’re almost as sweet, just as juicy, and when combined with other fruit, their slight bite complements sweeter fruit so perfectly. Berries, for example, are a perfect match for nectarines. I wish I could say that all of that rational thought and planning led me to this recipe, but it came about as most of my recipes to: to use stuff up. 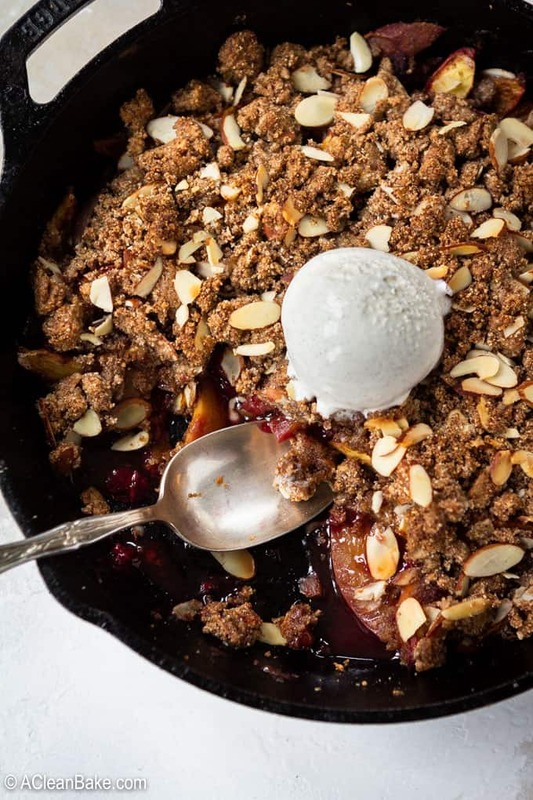 Plus, a crisp was really a no-brainer when I had a huge basket of slightly over-ripe nectarines on my counter just begging to become a dessert. I just added the raspberries because I could! Ok, enough about when I made this. Let’s get down to business and talk about how you’re going to make it. To call it a process makes it sound much more labor intensive than it really is. You need two large and two small bowls. You’re going to toss your fruit together with some lemon juice in one of the large bowls, and then quickly mix some dry ingredients like tapioca flour, coconut sugar, and spices, in the small bowl. Then you’ll fold the two mixtures together and put them in your greased pan. 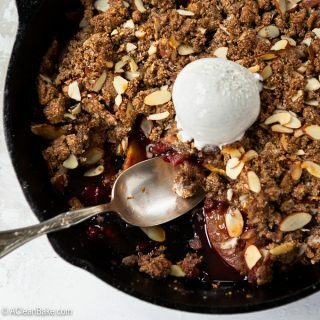 Once the fruit mixture is safely in the pan, you’ll make the crisp topping in much the same way: mix the dry ingredients, then the wet ingredients, then combine the two. Sprinkle the crisp topping on the fruit mixture, bake, and dig in while it’s still hot – or wait for it to cool. Your choice! I frequently get questions about prepping recipes ahead of time – of course! since you want to enjoy dinner with your family and friends, rather than slaving over dessert while everyone else is enjoying their meal – and like most of the desserts on this site, you can definitely make this ahead of time. As I said above, the crisp is fine if it’s served cool. 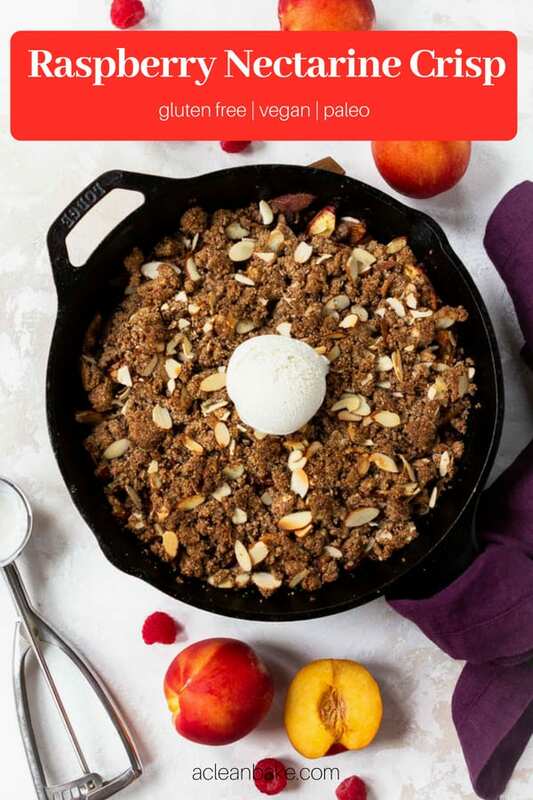 You can make it up to 12 hours before you plan to serve it and, if stored uncovered on the counter in a cool, dry place, expect that it will retain it’s namesake crisp topping. However, let’s face it, part of the appeal of a crisp is the residual warmth of the fruit that makes the ice cream all melty on top. So I’d recommend assembling the components of the crisp – the fruit mixture, the dry mixture that you’ll eventually add to the fruit, the wet mixture for the topping, adn the dry mixture for the topping – and storing them in four separate containers. Then you can just mix everything together and bake it right before you sit down for dinner. Let’s nerd out a little bit together, shall we? I want to teach you a little bit about the difference between a crisp and a crumble. First, the similarities: both are made of fruit baked in the oven with a dense topping that adheres to itself, rather than the fruit (compared to, say, a cobbler topping). 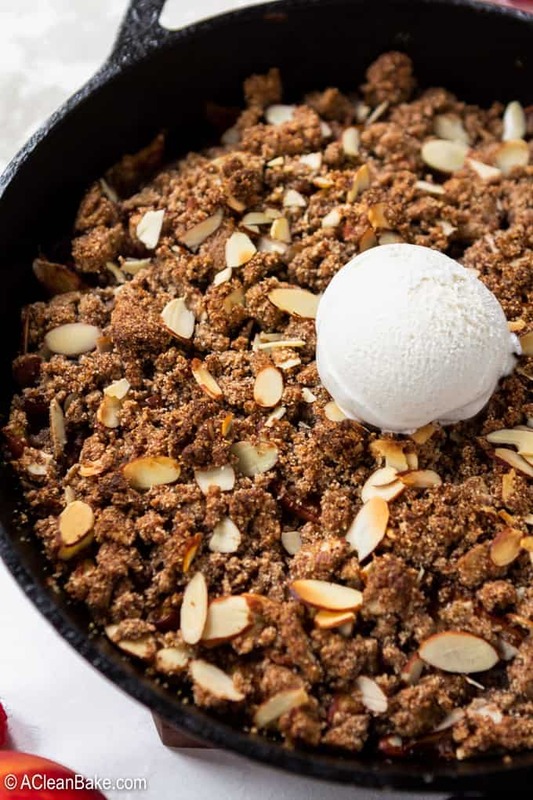 The key difference, in conventional baking, is in the ingredients: a crumble tends to be softer, butterier, and more tender, resulting in the kind of topping you’re familiar with on a coffee cake. Meanwhile, a crisp topping is heartier, because (again, in conventional baking), it is made from a base of rolled oats. To replace the oats in this grain free version, I added slivered almonds to the crisp topping to give it a similar toothsome crunch. 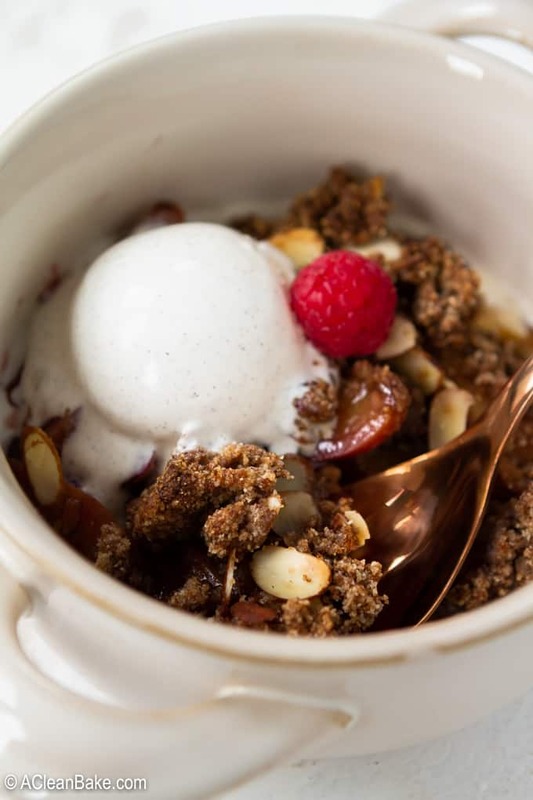 Plus, the flavor of the almonds compliments the nectarines and raspberries perfectly! Got it? Good. Don’t worry, there will not be a test. Speaking of substituting ingredients, I hear this question all the time too. I’m trying to do a better job of addressing possible substitutions upfront so that you have the answers you need right away! Fresh nectarines: You can use fresh peaches instead. Prepare them the same was as the recipe calls for the peaches to be prepared. Fresh raspberries: You can use another type of fresh berry (hulled and sliced strawberries would be perfect), frozen raspberries, and additional peaches or nectarines in place of the fresh raspberries. Tapioca flour: I know some people don’t tolerate tapioca well, so feel free to use arrowroot instead. Coconut sugar: You can swap in maple sugar (same amount) or granulated stevia or monk fruit (to taste). Do not use a liquid sweetener like honey or maple syrup to replace the coconut sugar. Cinnamon and ginger: You can leave one or the other out of the recipe, or adjust the amount to your preference. Flaked almonds: You can use the same amount of finely chopped raw unsalted pecans instead. Coconut oil: If not vegan, you can use grass-fed butter instead. 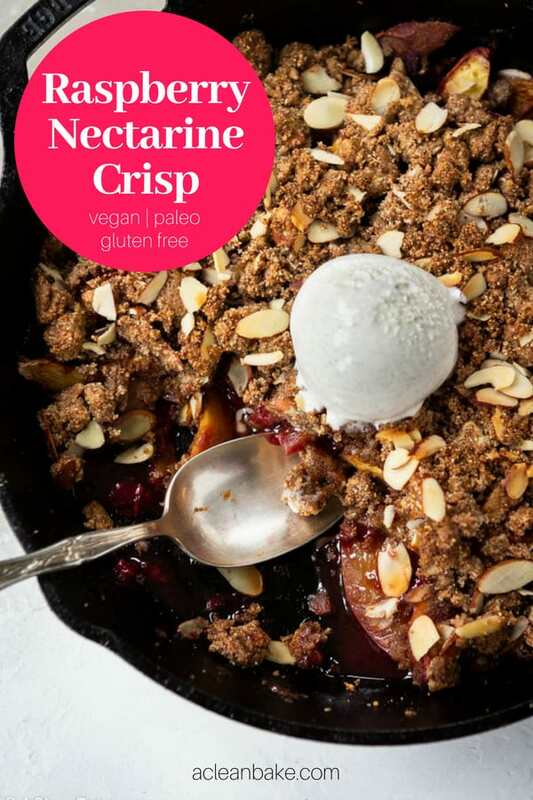 Raspberry nectarine crisp is a perfect grain free way to celebrate peak summer fruit! It's a simple gluten free, paleo, and vegan dessert that is simple enough for a weeknight, and elegantly rustic enough for an outdoor dinner party. Plus, you can make it ahead of time! Top with a scoop of your favorite ice cream and dig into the dessert of the summer. Carefully fold together the nectarines, raspberries, and lemon juice in a large mixing bowl. In a small bowl, whisk together the tapioca flour, coconut sugar, cinnamon, and ginger. Add the dry mixture to the fruit and carefully fold to combine. Gently transfer the fruit layer to the prepared baking pan and spread into an even layer. In a large mixing bowl, whisk together the almond flour, flaked almonds, coconut sugar, cinnamon, tapioca flour, and salt. In a small bowl, whisk together the maple syrup and oil. Stir the maple syrup-oil mixture into the dry mixture. Keep stirring (gently) until clumps form and most of the dry mixture is hydrated. There will be some dry mixture left at the bottom of the bowl, but there shouldn't be much. Sprinkle the crisp topping evenly over the top of the fruit mixture in the pan. Bake for 30 minutes, or until the fruit mixture bubbles around the edges and the top of the crisp turns golden brown. Serve immediately, or store uncovered at room temperature for up to 12 hours before serving. Tapioca flour: I know some people don't tolerate tapioca well, so feel free to use arrowroot instead. Leftover crisp keeps in an airtight container in the refrigerator for up to 3 days, or in the freezer for up to 2 months.